The Customs Administration (hereinafter referred to as “CA”) is led by Director General who is assisted by two Deputy Director General, two Senior Researchers and a Chief Secretary. CA establishes six Departments and six Offices as the organizational chart below shows. Each Department/Office may establish sections in accordance with the need of affairs execution. 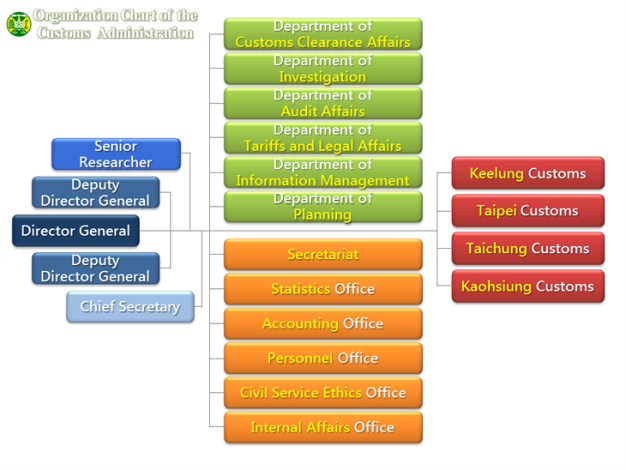 Under CA, there are four field Customs, namely Keelung Customs, Taipei Customs, Taichung Customs, and Kaohsiung Customs. Each Customs sets up, as circumstances demand, a number of administrative and operational units. A total of ten branches are established at auxiliary ports, airports, post offices and container terminals to perform Customs functions and provide the traders and the general public with facilitated access to clearance procedures.